I spoke to author Ben Greenman a while ago to get his perspective as an “expert” on New York City. He recommend five (well, seven actually) books that provide insight for travelers to the apple, for the site FiveBooks.com. Ben Greenman has been the editor of The New Yorker’s Goings On About Town section, which lists and reviews events in and around New York City, since 2000. 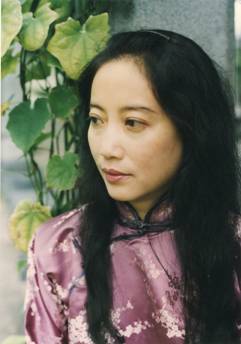 He is the author of a number of short story collections and novels, including, most recently, Celebrity Chekhov. Why should a visitor to New York use the Time Out guidebook? It’s a nice mix of attitude and nice photography, but it also does something which some of the books don’t do because they are more staid or institutional: it finds some of the smaller places that you wouldn’t ordinarily think of, like clubs and smaller galleries. There is a kind of big, lumbering elephant way of doing the city, which is the Met, Central Park, Guggenheim, and this is not really that. They also do a separate restaurant guide, so if people are coming and they really want to eat their way through the city, there’s a separate book as well just for that. But I just think it’s a good book that’s not cluttered by stagey history or long histories of buildings, and it’s very good on neighborhoods. It’s smart about getting you through the actual geography of the city. The New York Lookbook seems an altogether different kind of guide. It’s a feature that New York Magazine ran for five, six years. This is a very active, vibrant city where a lot of things are happening, but two of the biggest industries are, of course, publishing and then fashion. So, how people dress in the city and the way they think they’re presenting themselves is always a big deal. I work in the Conde Nast building, and it’s a big deal here in the building, and in a bunch of different ways, it’s a big deal in the city. And so this book, published by—I should point out—a competitor, is collected from these features. It talks to people about what they’re wearing and then has these quirky little interviews about their sense of style and clothing, like, Why are you wearing a rain boot on your head? So it’s just people they’ve pulled off the street? Yes, it’s street interviews, and what’s nice about that, too, like the Time Out book, is you get a real sense of the blood flow of the city. People you would think of as real downtown-y people are caught on a corner in the Upper East Side, and it has an interview with them that tells you where they are found in the city. There’s also a little guide in the back to buying costume jewelry or crazy shoes and what not. People come here and they look at buildings and they look at art, but as with any city one of the things that really draws people are these more personal pleasures—food and clothes. I like the idea that guidebooks know that. It’s better to give people a sense of what they’ll be doing in between. What do you think the Lookbook says about New York? Most of us wear clothes—I would say that’s generally true. And then, I just think it’s a nice lens to look at the city through. Now with Project Runway and all these kinds of shows people do think about the city in this way; fashion week has become a bigger and bigger thing. The good thing about that book is it’s so diverse—it’s a range of people. Your second book, Power Broker, has been called the greatest book written about a city. Why does it do such justice to New York? It’s such a big, big thing and hard to distill. If you look at pictures of places you can get a sense of what things seem like. But hopefully what books do, or what thinking does, is show you what things are like underneath. This is the definitive history about how in modern America cities get built, how power gets thrown around, how neighborhoods are overpowered by developers and politicians. It’s gigantic and it’s a biography, but it reads like the most epic novel of money and power and building. It’s by Robert Caro who is a definitive biographer; he went on to write a definitive biography of Lyndon Johnson. And it’s about Robert Moses, the most influential builder and urban planner in the city in the middle of the century. He was someone who was not ever given that power—he just decided he was going to do things, change the shape of the land and build a ton of roads and bridges. Whatever you see in the city that is the city — the shape of the city, the body of it — was his doing. So this gives you a view underneath the surface you’re seeing as you walk around? It’s like a surgical theatre when they pin the body open and you’re the medical student up top and you’re watching and they show you, ‘Look, this is the lung.’ And there are incredible battles of incredibly powerful people. He had a battle with Franklin Roosevelt before Roosevelt was president, about where they would build these parkways. Roosevelt wanted the Taconic and Moses wanted another kind of parkway system so he fought. In most cases, he was able to steamroll everybody and advance his own power. He comes off as a villain—I wouldn’t say exclusively; he obviously accomplished a lot of important things but was a problematic figure in power. Recently people have been saying, look, he was able to keep things going, to keep bridges up and keep potholes filled, so in the last ten to fifteen years there’s been a swing back to crediting him. He was able to maintain some things that have proven harder for other people to maintain. He really wanted things done. When people who aren’t here think of New York, they think of the bridges and skyscrapers and of just how big the city is, the bigness of it. But how does it all work? This is a great book for understanding how it came to be that, what the monuments are and that there were people behind them—very problematic, stubborn and sometimes crazy people, but still people. Your next book, Here is New York, has been described as a love letter to the city. Having just written an epistolary short story collection, What He’s Poised to Do, do you also see it that way? In my experience, because I’m a writer, it’s a very important city for writers, and because I work at the New Yorker, it’s a very important city for certain kinds of writers. This is a book where there was a travel series where they had reporters and editors try to corral writers and have them talk about their travel. They might take Paul Bowles to northern Africa and he’d guide them around. And they wanted E.B. White for this project, but he didn’t want to travel; he was not a big traveler and stuck close to home. He came back into the city from Maine and walked around and thought about what he had experienced here when he was younger. It’s a great snapshot of how the city changes slightly over time, and I guess that’s why people say it’s a letter because he’s revisiting it. It’s not formally a letter, but he’s coming back and he’s grappling with his own memories. In my book, I say a lot of letters are about longing and missing things and that’s certainly the case here—having these memories and trying to square them away with how things have changed. It’s a very clear and interesting and multi-generational picture of the city through a certain kind of lens, a certain kind of writer. It’s obviously not everybody’s experience, but this kind of experience is very sharply focused and very well drawn. It’s post-war, and after he walked around he holed up in a hotel room and said, let me remember to myself what I experienced here. It’s a strange travel book because it’s sort of the opposite of a travel book, because most travel books are all about newness. This is a revisit instead of a visit. At one point, White’s book was reviewed by Luc Sante, the author of your next book, Low Life. How does Sante’s portrait compare? This is a story that doesn’t get reported on and it’s classed as a work of scholarship but it’s also very fun for people. When people come into New York, if they’ve never been here before, they think of the dangers, purse snatchings and peep shows—that’s part of the appeal. Any giant city with this many people so close together, that’s going to happen. So his mission here is to go out and make sense of all of that. It’s an extremely engaged, really fun and smart book about those kinds of things. The movie Gangs of New York is in some ways a more political look, but it’s that sort of feel. The book goes all the way up to the early ‘20s but it starts in 1840 so it basically covers the Civil War, the turn of the century, and how the industrial shape of the city changes up to the 1920s. What’s good about this book is that in Power Broker you can still see the traces of most of what Caro talks about; the bridges are all still there, the buildings are largely still there. But if you peel away one whole layer, then you get to Low Life, which is that a lot of it’s gone, a lot of these things are not there, they’ve been built over, they’ve been paved over. For me, the nicest thing about this book — and I want to say this as a compliment and not have it come off as an insult — is it’s kind of baggy pants. You can have books that are really tight, that work like corsets, that are super meticulously edited and pruned. This book has a lot of overgrowth. There are sections that are rambling and there are these fantastic digressions. He seems to be on the edge between myth and true grad-student level three-source reporting. There are all these stories about criminals, here’s how this murder gang operated, and you think it’s probably true but it’s not like these people had reporters embedded with them. People always call it a secret history or hidden story—there’s a sense that he’s uncovering. Words everybody uses when they talk about this book are secret, or under, or those kinds of words. But that idea that it’s something that was not seen that he brings into the light—that’s a really nice sense. I feel that when you go to a city you should have that—you should have the ghosts around you. When you’re walking around, you should know if it’s the case that on this corner 150 years ago somebody got a bullet put in their head. Now, I don’t know that that happened, I’m just making that up, but something like that. Since it’s set so long ago, would contemporary travelers think that’s long gone history or see yet another layer they’re standing on? I think for me, when you meet a person and you’re talking to them, as the conversation becomes more interesting you start to ask them things about where they grew up or, ‘Oh, you switched schools in fourth grade—why?’ It’s a very, very dynamic, colorful, vibrant book; it’s not boring at all—I don’t think there’s a boring second in it. So in that sense, you get more appreciation for what you’re standing on and what you’re standing near. You also wanted to highlight two other books. Tell me about Night Inspector by Fredrick Busch first. He’s a writer who I especially like and who I don’t think is that widely read now. I don’t know if everybody wants to experience cities the same way, but I like to read about places I’m visiting. Then you can come at them weirdly sidewise. This book goes right back into the middle of 19th century New York City. When people think of the Civil War, I don’t think they think of it has affecting the northern cities, really—you always think of the big fields and soldiers lined up on either side of a meadow. This book is about a guy who was a sharpshooter in the war who then returns to the city—it’s a good balance to E.B. White’s book because it’s 100 years earlier; it’s fiction but it’s the same kind of thing. He’s in Five Points, which is the neighborhood that’s very prominent in Low Life. It’s a crime-ridden, gang-infested neighborhood in lower Manhattan. It’s a very weird story. The guy is disfigured and he’s a war survivor. He meets Herman Melville as the story goes along, so there’s a lot about the city’s literary heritage. It’s a great book; it’s very weird and mysterious and hard to sum up, but I want people to read it. It’s filled with masks and there’s a lot of weird violence in it. It’s sort of about what happens in cities after wars when everybody comes back to them with all the things they can’t forget and bring back with them. It’s relevant now—people are coming back from wars now obviously and New York is a city. One reason this book is good for me now is it’s a very good post-trauma book. The city is still is a post-traumatic city because of 9/11. Everyone is still working through the effects of that day. Yes. We’re coming up on the 10th anniversary next year. It’s not that people walk around with a weight on their heads, but it’s there on some level, and in a very different way it’s there in this book. The way Fredrick Busch deals with these kinds of things—violence and disguise and all these great literary themes—is great. And then he’s dead, too, which is annoying and sad because he was not that old and was still writing a lot of very good, interesting weird things. He was born in Brooklyn in the early ‘40s and he died when he was in his mid-60s. Do you have a special interest in Harlem that led to you highlighting Harlem: The Making of a Ghetto? I am interested in that period and how certain kinds of culture began to spring up, starting with the Harlem Renaissance, which you read about in high school, but then you go outward from that and you start to see how all of the music, art and literature blossomed from that. It’s a very good, very well researched history—good, worthy and smart—and a very good social history of the city. Rather than have your experience of the city be Soho, Union Square, Times Square, this book gives you the idea that there are places in the city that have incredibly rich histories, where every building is interesting and which have gone through many evolutions over the years. But it’s only one of a number of books like this. You can find equally good books about the Italian neighborhoods in New York, or the Jewish neighborhoods, or the Irish neighborhoods, or the suburbs, or about the Bronx. So I say find the version of this book that will interest you the most. If you’re coming here and you’re Dutch, find a book on where the remnants of the Dutch settlement are in New York. If you come in and you’re Irish, find that book. There’s a book like this for almost any part of what is the most diverse city in the country. Imagine coming home starving late after work, and finding only package of instant ramen in your pantry. For Chef D.K. Kodama that experience was an opportunity to create a great late night meal. Today, that midnight snack has been developed into the foodie-pleasing saimin that’s now a comfort food hit at all Sansei Restaurants. Why? Bet you wish your late night food experiments were this creative. 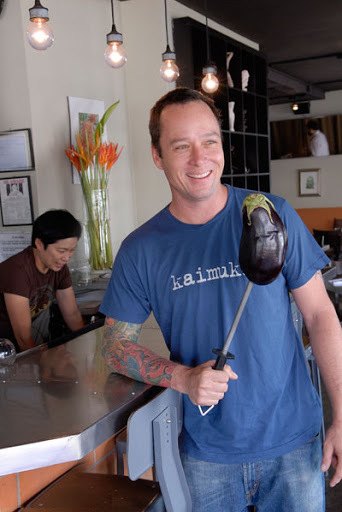 When you glimpse self-professed “noodle freak” Ed Kenney Jr. leaving his Kaimuki darling Town Restaurant, the first thing you notice is his sleeve—not snowy chef coat sleeves, but multihued tattoos covering his right arm and peeking out from his shirt on the left. Perhaps this is why Kenney’s been labeled a culinary maverick, or maybe it’s his position on the soul side of the current divide between brainy, molecular gastronomy riffs on familiar dishes and farm to table trends. Or, it could simply be his reverse restaurant model at Town and sister location Downtown at the Hawai’i State Art Museum (or his cheekily named new catering division, Uptown). “Usually, you set a menu then cost it, and that’s how you regulate how much money you make. We did the opposite—we change our menu based on what we have,” says Kenney. Yet while the ingredients change, they always remain grounded in Town’s motto: local products first, organic when possible—which is quite often given a close relationship with Ma’o Organic Farms. Kenney incorporates everything from ulu to Italian succulents to wild boar into his peasant Mediterranean cooking—no foams or drizzles here—and it seems to work an elegant magic. Lawyers make great storytellers. 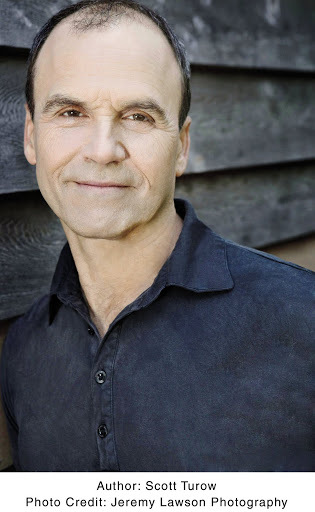 Chicago criminal defense attorney, onetime Stanford writing teacher and bestselling author Scott Turow has a good explanation why: “Every trial lawyer lives by the motto that if you want to teach a jury something you tell them a story,” he says. It’s no wonder he has soared in parallel careers since publishing One L, about his first year in Harvard Law School, in 1977, and his breakout novel, Presumed Innocent, which marked him as a genre-busting, literary legal thriller writer, in 1987. Eight other books and more than twenty years later, Turow has come back to the beginning. His new novel Innocent—the first full-length one in five years—resurrects Presumed Innocent’s Judge Rusty Sabich, now a bit older and once again at odds with adversary Tommy Molto after the enigmatic death of Sabich’s wife. 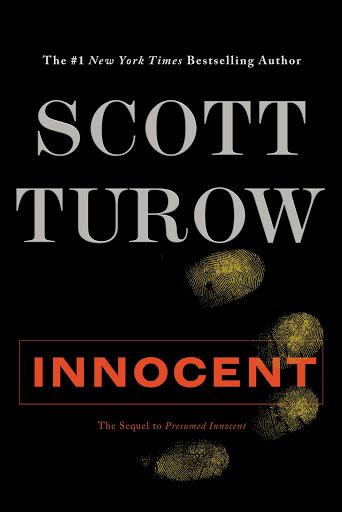 Even though Innocent can function as a sequel, Turow was conscious not to imitate its predecessor. He sets it apart from the opening with a first-person narration, not by Sabich, but by his son—one that also offers a chilling glimpse of the novel’s thematic exploration of change, love and loyalty—then rotates through multiple viewpoints of Sabich, Molto and an important female character. But because Turow writes his way through stories rather than thinking them out beforehand, he wasn’t always sure how Innocent would be structured. “You put your heart and your hands out in front of you and see what happens,” he explains. Like his other books, Innocent started out with an isolated event, this time written on a Post-it note. “At some point I had jotted just a little idea for a scene—a man is sitting on a bed in which the dead body of a woman lies,” he says. Whether that’s the comic thriller idea he’s been pushing around or that play he’s always wanted to write, it’s certain his next creative endeavor will be surprising.